The LEZ Madrid/M-30 environmental zone is the surrounding, temporary environmental zone of the ZEZ Madrid/Central. This urban LEZ (Low Emission Zone) environmental zone is also called ZBE (Zona Bajas Emissions) in Spain and was approved by the City Council of Madrid on 27.09.2018 in the Protocolo de actuación para episodios de contaminación por dióxido de nitrógeno and came into force on 08.10.2018. 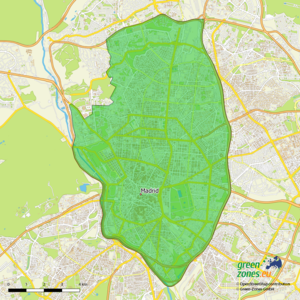 On the basis of the 5 scenarios of the protocol, the LEZ Madrid is dividided into two zones by Green-Zones: Madrid/M-30 and the surrounding districts of Madrid city. The LEZ Madrid/M-30 environmental zone is located on and within the M-30 motorway ring road around the Madrid/Central zone. The LEZ Madrid/M-30 includes 47 parking areas, which have been set up in the 7 inner city districts of a total of 21 urban districts in Madrid and are subject to a regulated parking concept (SER zone). The 47 SER parking areas are an element of the city’s air protection protocol in case of an air pollution peak. See also the right margin column. In the Madrid/M-30 environmental zone, traffic restrictions and/or driving bans apply during weather or traffic-related pollution peaks, which are staggered according duration and intensity in up to 5 scenarios. This ranges from speed reductions, the promotion of public transport, the prohibition of parking in many places to driving bans. The area of the LEZ Madrid/M-30 with its outline in the form of an almond covers about 60 km² and is likely to have half a million inhabitants. The surrounding M-30 motorway ring road is the main artery of the city of Madrid, which has around 3.1 million inhabitants. The most likely driving bans for vehicles without a Distintivo Ambiental (affecting EURO classes 0-3) will occur when scenario no. 2 comes into force, i.e. when the early warning stage has been proclaimed on two consecutive days. In another scenario no. 4, the warning stage bans the B badge class from traffic on and within the M-30 motorway ring road. In case of scenario no. 5, the worst alarm stage, for example, the B and C badge classes are banned from traffic. This means that only electric, gas and hybrid vehicles are allowed to enter the LEZ Madrid/M-30. For all 5 scenarios read the info on the right hand-side column. The two Madrid/Central and Madrid/M-30 environmental zones regulate the entry access rights, the parking areas and their costs via a regulated parking system, the 5 stages of the air protection protocol and the four badge types. Uzależniona od pogody strefa ekologiczna LEZ z ograniczeniami ruchu drogowego i zakazami jazdy, obowiązująca po ogłoszeniu ostrzeżenia wstępnego, ostrzeżenia albo alarmu przez Radę Miasta Madrytu w przypadku fazy zanieczyszczenia powietrza przy wartościach NO2 większych niż 180, 200 i 400 µg/m³. Od 2020 strefa będzie przekształcona w stałą strefę LEZ i nie może w niej parkować żaden pojazd bez plakietki. Następnie od 2025 nie będzie mógł tam wjechać żaden pojazd bez plakietki. Obszar strefy ekologicznej Madryt/M-30 obejmuje centrum miasta. Jest to 7 z 21 dzielnic (distritos) Madrytu: 1 Centro, 2 Arganzuela, 3 Retiro, 4 Salamanca, 5 Chamartín, 6 Tetuán, 7 Chamberí, które znajdują się wewnątrz obwodnicy autostradowej M-30. In the LEZ Madrid/M-30 and Madrid/City zones, weather-related traffic restrictions and driving bans are possible, if one of the warning levels described below is proclaimed due to too high NO2 values at the measuring stations. All measuring stations in Madrid are divided into 5 measuring districts (1-5). The LEZ Madrid/M-30 corresponds to measuring district no. 1. Outside the measuring district of Madrid/M-30, the city is divided into measuring districts no. 2 (southeast), no. 3 (northeast), no. 4 (northwest) and no. 5 (southwest). Stage 1 early warning: When any two stations in one of 5 measurement districts simultaneously display 180 µg/m3 for two consecutive hours, or any three stations of 5 measurement districts simultaneously exceed 180 µg/m3 for three consecutive hours. Stage 2 warning: When any two stations in one of 5 measurements districts simultaneously exceed 200 µg/m3 for two consecutive hours, or any three stations of 5 measurement districts simultaneously exceed 200 µg/m3 for three consecutive hours. Stage 3 alarm: When any three stations in the same measurement district (or two in the measurement district no. 4) simultaneously exceed 400 µg/m3 for three consecutive hours. · Information and recommended measures by the City of Madrid. · Promotion of public transport. · Speed reduction to 70 km/h on the M-30 motorway and its access roads. · Prohibition of traffic within the M-30 motorway or on the M-30 motorway for all vehicles without a Distintivo Ambiental of 0, ECO, B or C classes. · Prohibition of parking in Regulated Parking Areas (SER) for all vehicles without a Distintivo Ambiental of 0 or ECO classes. · Prohibition of traffic in the entire municipality (Madrid/City) for vehicles without a Distintivo Ambiental of 0, ECO, B or C classes. · Recommended driving ban for free taxis, with the exception of taxis with a Distintivo Ambiental of 0 and ECO classes. · Prohibition of traffic in the entire municipality (Madrid/City) for all vehicles without a Distintivo Ambiental of 0, ECO, B or C classes. · Prohibition of traffic within the M-30 motorway or on the M-30 motorway for all vehicles without a Distintivo Ambiental of 0, ECO or C classes. · Prohibition of traffic in the entire municipality (Madrid/City) for all vehicles without a Distintivo Ambiental of 0 or ECO classes. · Prohibition of parking in Regulated Parking Areas (SER) for all vehicles without a Distintivo Ambiental of 0 class. · Prohibition of circulation for free taxis, with the exception of taxis with a Distintivo Ambiental of 0 or ECO classes.